Yes, Billy was lost. But he was also plump and juicy! May 1943. "Washington, D.C. A sign at the National Zoological Park." Photo by Esther Bubley for the Office of War Information. View full size. Submitted by Solo on Mon, 04/29/2013 - 12:47pm. This is a solution not universally applicable to all zoos. Many have been unable to teach their lions to spit out the zippers and buttons, with resulting digestive distress. Submitted by StefanJ on Tue, 04/30/2013 - 11:47am. That's definitely a swell punchline the zoo management is giving the parents to impress orderly behaviour on their menacing Dennises. "Listen, son, stay close, or else the nice people of this zoo will put you with the lions." Stage two: "And the lions are hungry!" Stage three: "I'm sure they also provide doggybags for the leftovers." Submitted by Pikkewyn on Mon, 04/29/2013 - 6:11am. There was a war going on and the zoo had to do what it had to do. Submitted by stanton_square on Mon, 04/29/2013 - 5:30am. Washington Post, June 26, 1955. 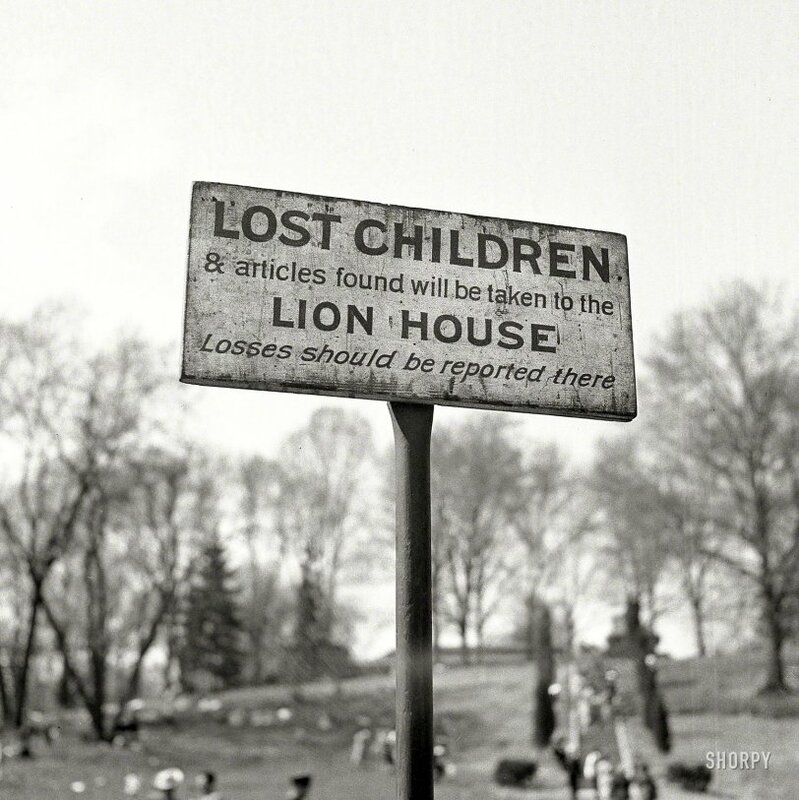 “Lost children will be taken to the Lion House” is the Washington Zoo's most quoted sign. Outraged parents of straying tots protested vigorously until they discovered zoo police headquarters was sandwiched above the lions. Now, at long last, the sign will be changed. Come winter, the Zoo is to have a new building, housing among other facilities, police headquarters and the most up-to-date comfort station. So now Zoo officials are being bombarded with humorous suggestions about wording a new sign! Submitted by Michael R on Sun, 04/28/2013 - 9:51pm. When I was a little boy in the 1960s, I got separated from my mother at Chicago's Lincoln Park Zoo. Somebody took me to the Lion House (now an architectural landmark, still with lions inside it), and a voice went out over the loudspeakers calling for my "lost parents" to come and get me. I guess lions and lost children go together like (insert lyrics from "Grease" here). Submitted by DRGW476 on Sun, 04/28/2013 - 7:55pm. Sorta raises the question of what happens to children, uneaten lunches, and misplaced haunches of venison left unclaimed at the Lion House. So many hungry lions, so few foundlings. Submitted by Doc Dave on Sun, 04/28/2013 - 7:36pm. Do you think that the Management of the National Zoo saw the irony? Submitted by Brett on Sun, 04/28/2013 - 6:31pm. Lion house, eh? What if they aren't picked up by the end of the day? Submitted by Lupinelle on Sun, 04/28/2013 - 5:46pm. "For items you may have accidentally left at the Zoo, please call the Zoo Police at 202-633-4111, or visit the Police Office off Olmsted Walk just above the Mane Grill."